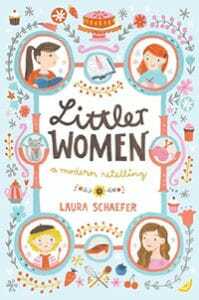 First published in 1868, Little Women is an American classic that celebrates its 150th anniversary in 2018. So it’s no surprise that it has its fair share of modern retellings. Some are more true to the source material than others, but all of these updates are worth checking out for readers who love the original. How many of these Little Women retellings are on your shelf? This charming adaptation is the perfect way to introduce younger readers to the classic version. Meg March, age 13, and her sisters Jo (12), Beth (10), and Amy (9), are best friends who stick together through good times and bad. Throughout one eventful year, they go to school dances and sleepovers, get to know their next-door neighbors (the Lawrences), swoon over their first crushes, and become closer despite their differences. There’s a recipe or a craft project at the end of each chapter for added fun. This retelling has a bit of a twist — the main characters are descendants of Jo March. Big sister Emma is planning a wedding, and the youngest sister, Sophie, is debuting a performing career on the London stage. Meanwhile, Lulu Atwater feels like the family dud: she’s happy for her sisters’ success, but her own life seems stuck in a rut of dead-end jobs and no romantic relationships. 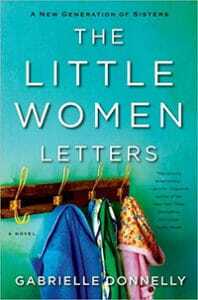 But when Lulu discovers a treasure trove of letters written by her great-great-grandmother, Josephine March, she finds unexpected comfort in the wisdom and understanding of her ancestor. Can Jo’s guidance help Lulu find her own happiness? 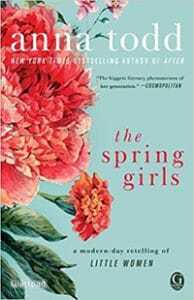 It may be a little controversial to include this one, as the author has said it’s not a retelling of Little Women, but it’s certainly a modern interpretation that wouldn’t exist without the original. 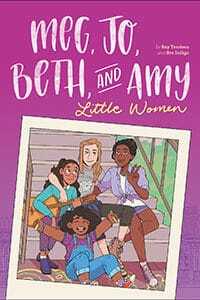 In this version, Meg, Joanna and Amy Green (Beth is downgraded to a pet turtle who didn’t survive) are upper-middle-class girls growing up in New York City. Meg, at 20, is the responsible, quiet eldest; Amy, 15, is the spoiled baby; and Joanna, at 17, is the rebel. The Greens’ seemingly perfect family is shattered when their mother’s affair leads to a seemingly too-easy forgiveness from their father. In protest, Joanna and Amy move in with Meg at her apartment near campus. Joanna narrates the story, but the other sisters’ comments are sprinkled throughout the text, replying to or disputing her telling of the tale. This one won’t be for everyone, but the experimental style is definitely a new direction. If you prefer viewing to reading, there are several TV and movie Little Women retellings coming soon, too! And if you want to read more about the novel’s cultural significance over the last 150 years, check out Meg, Jo, Beth, Amy: The Story of Little Women and Why It Still Matters. What? Katharine Weber here. Stephanie Perry, did you read my novel? The mother’s affair in The Little Women is not a lesbian affair. Why do you say that? It’s an affair with a male grad student. Bigoted reaction from the father? NO SUCH THING! In fact, he forgives his wife, while the girls do not forgive her, which is what sets the story in motion. What makes you say these wildly wrong things about my novel? Good god. I actually haven’t read it; our library doesn’t own a copy, so I was working from online plot summaries. If my synopsis isn’t accurate, I’ll update. Thanks for your comment! Thank you. I have never seen such a bizarrely plot inaccurate summary, ansd wonder if you took the word of a Goodreads review or something like that. You can find information, reviews, etc on my website, book by book. 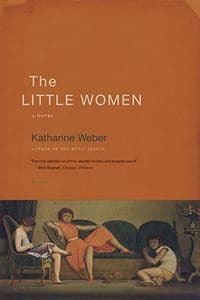 See especially the Richard Eder review of The Little Women in the The New York Times.